Whether an experience creator is looking to build a new attraction, reimagine an aging one, or construct an entirely new park, the question of “what story will this experience tell?” is always present. The question of what piece of intellectual property drives that story—established or wholly original—usually follows suit. That decision, however, is rarely straightforward, even amongst the biggest and most successful brands. Disney’s infamous inability to use much of the Marvel universe at its Florida properties due to a perpetuity clause in the licensing deal with Universal Parks & Resorts comes to mind, although one can imagine Disney feeling pretty happy with its library of IP these days thanks to the acquisition of 21stCentury Fox’s entertainment assets. Now can we get that Buffy theme park? Considering the use of IP for an experience can feel like feast or famine for experience creators; the biggest studios appear to have the luxury of boundless IP, while smaller or more cost-conscious organizations may have to work harder to find relevant characters and stories, whether through complex licensing deals or their own creativity. At Day Two of this year’s TEA Summit, Thea Case Studies Day, Thea Award recipients not only represented projects from across the budgetary spectrum, they also represented a diverse range of approaches to identifying and implementing IP in their projects now recognized for Outstanding Achievements. Early on in the four years it took to develop the Universal Spectacle Night Parade at Universal Studios Japan from concept to completion, the creative team at Universal Parks & Resorts considered over 18 different IPs before ultimately deciding on the four franchises represented in the final parade: Jurassic World, Harry Potter, Despicable Me/Minions, and Transformers. For a parade intended to celebrate “The Best of Hollywood” it was a review process, Mike Davis, Senior Vice President-International Entertainment and Project Director at USJ, Matthew Preston Jones could not take lightly. That process included creating varying levels of design concepts for all 18 IPs, considering how franchises would physically translate into the park environment, weighing them against other areas of the Comcast NBCUniversal business—its “Symphony” strategy in action—and perhaps most importantly, how each IP would translate for the Japanese audience, something that Davis emphasized several times during his presentation. The result of his efforts along with those of roughly 1,000 staff and vendors is a fluidly choreographed, total immersion into these fictional realities. “Every Polish man knows the story of the Basilisk” said Legendia Director, Paweł Cebula. So, when the theme park contemplated a new attraction to mark its 60-year history, the legendary Basilisk—a snake with a rooster’s head—made it “the best IP you can imagine” on which to base Bazyliszek, Poland’s first interactive dark ride created with the help of Alterface, Jora Vision, and ETF Imaginative Engineering. Indeed, as the Thea Awards Committee noted in its remarks, “Delivering an attraction that is well integrated in its cultural context, but that manages to deliver a compelling modern and fun experience is not only remarkable, it is also a great alternative to major IP offerings. Bazyliszek is an outstanding model of an attraction that speaks to its regional audience.” The attraction’s narrative furthers that connection to the parks guests by integrating original characters found elsewhere in the park, making it a contender for the “meta attraction” designation we previously wrote about on our blog here. For its 22nd theme park, Oriental Heritage in Xiamen, China, Fantawild Holdings melded traditional Chinese culture and modern technology through 12 attractions across nine themed areas. “China has a long history,” Fantawild Holdings Executive President, Daisy Shang told Park World, “There are a lot of stories to tell.” Indeed the sheer volume of stories from over 3,000 years of history meant Shang and her team conducted a great deal of research in order to come up with the right narrative foundations for the park’s media-heavy attractions. “Some cultural stories are very famous but some elements are not suitable for modern audiences,” Shang told the TEA Summit audience. Others, like the legend of the Butterfly Lovers, featuring the characters Liang Shanbo and Zhu Yingtai known as the Chinese Romeo and Juliet, were such a part of the Chinese mythic tapestry that including them in the park was an easy choice. 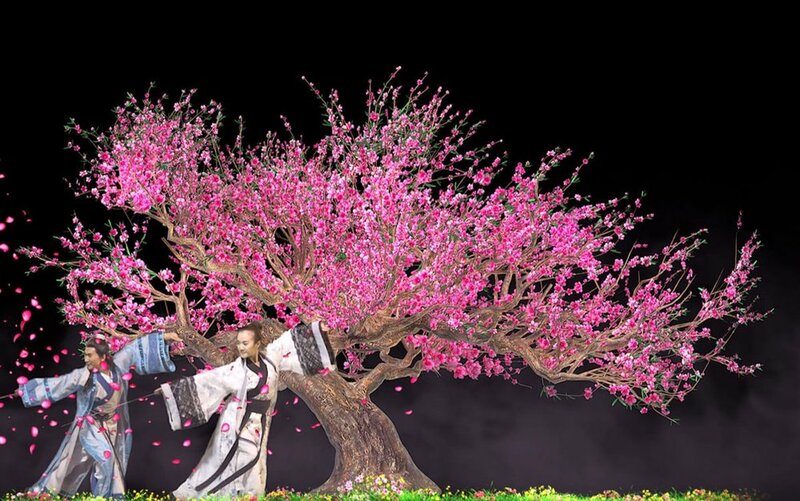 “The Butterfly Lovers” Zhu Yingtai and Liang Shanbo in the Panoramic Augmented Reality Theatre at Oriental Heritage © Fantawild Holdings, Inc.
“What if we wake up one morning and find the busses no longer there?” That was the existential question posed by Rob Shenk, Senior Vice President for Visitor Engagement at George Washington’s Mount Vernon, that became the genesis of the Be Washington: It’s Your Turn to Lead interactive theater experience created in part by Cortina Productions. In the on-site experience—also available on the web for in-home or in-classroom participants—guests face some of the same crises that Washington confronted during his presidency with the aid of on-screen advisors and gamified interactivity. To relay the same urgency Washington must have experienced to guests, participatory moments are timed and everything is rooted in history. “We didn’t need to invent any heroic stories,” Shenk said, “we just needed new ways to tell them.” In each of the four possible scenarios, the heroism of Washington and others is realized in rich, cinematic scenes played out on a 6K screen while 36 guests stay engaged with 18 touchscreen kiosks. Through its self-imposed directive to stick to the facts, use primary sources, and eschew any alternate universe narratives, Be Washington demonstrates that the key to learning history is to live it. In a video introducing the story behind Universal’s Volcano Bay Water Theme Park, Dale Mason, Vice President & Executive Art Director at Universal Parks & Resorts, tells the tale of the fictional Waturi people who traveled the world’s oceans in search of a new home. During their voyage across the South Pacific, they “made friends and collected the culture” from real-world places such as Tahiti, Bali, and the Chilean island of Rapa Nui (aka Easter Island). One of the ten creative principles that drove the Universal Creative team in the development of Volcano Bay was the aim to achieve “plausible fantasy,” something this blending of authentic cultures and fictional creation certainly suggests. Of course, using art, architecture, language, and other iconography from real cultures can make for a tricky tightrope to walk. Overall, Mason says, “there’s an incredible amount of work that goes into making sure we’re making the right decisions.” While Volcano Bay may not feature characters and locations guests already know and love, having IP that celebrates exploration, friendship, and cultural diversity ensures guests from all over the world feel a sense of belonging throughout their stay and beyond. IP or its implementation can make or break an attraction (or in some cases an entire park), which is why the research phase was paramount to each one of these projects. What worked yesterday may not work today, and given the investments these experiences represent, the choice of IP has to resonate with the tomorrow’s audience just as much as it does with today’s—2, 5, or even 10-20 years down the line. The experience creators that took the stage at the TEA Summit Thea Case Studies Day may have come from an incredibly diverse backgrounds, but together, their stories demonstrate that despite quite different approaches to IP, history, myth, culture, and the best of Hollywood are timeless keys to success. VIZIR PRODUCTIONS was founded on a love for research and delivering creative that maximizes the potential of story worlds represented by IPs and brands. Contact us to discuss how Vizir can help guide your vision from concept to completion.